In December, LINGOs announced the first global giveback campaign, which paired elearning developers with humanitarian organizations that needed some elearning courses produced. Like many of you, David Anderson and I took up the challenge and volunteered to create a course for Christian Aid. For this project, we had no budget with limited time and resources. So I thought I’d share a little about how we built the course and some of the decisions we made because they’re common to many rapid elearning courses. Check out the course we built and then look at my notes below. Click here to view the Christian Aid demo. We only had a couple of weeks to work on the course. This didn’t leave a lot of time for production. Typically this type of constraint dictates a simple course like a linear, click-and-read. But we wanted to have some interactivity. The approach we took was to offer two tracks. 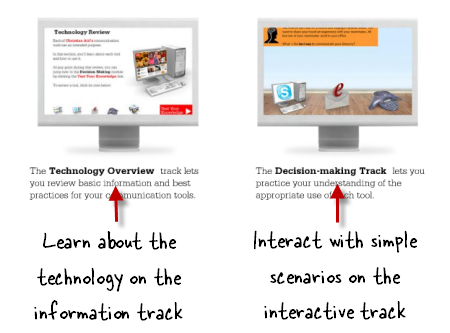 One was information specific, and the other was a bit more interactive and learner-centric. Information track: Some people just want information and prefer a linear flow. So on one track we offered the core information. But we freed it up so they only had to click on the information they needed and not go through each piece. Interactive track: This track was designed to present the information technology through some simple interactive decision-making scenarios. The choices they had to make were similar to the choices they’d make at the organization. It didn’t require that the person know anything about the technology. We gave them the additional information as feedback. To take away some risk, we also provided an option of reviewing the technology before making a choice. Essentially both tracks were the same; they just presented the information in slightly different ways, giving the learner some options and freedom in navigation. Tip: Give the learner as much control as possible in how they get their information. On top of that, the approach we used is a good one if you want an interactive course, but your client wants an information dump. 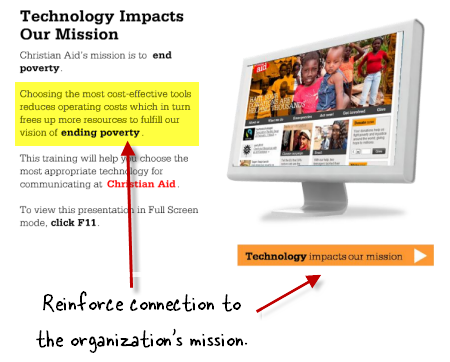 Our course content was about communication technology and probably not that interesting in comparison to Christian Aid’s core mission of humanitarian aid. We felt that it was important to tie the course into the organization’s larger mission. So the course we designed was less about technology and more about making cost-effective choices that impacted the mission in the field. 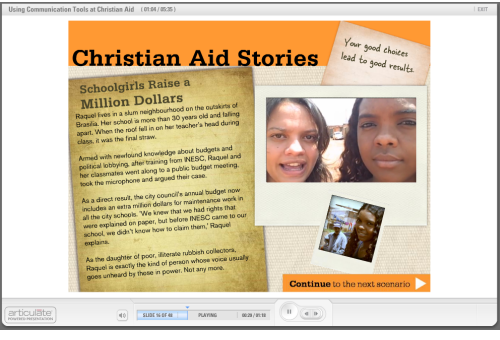 In between the communication technology pieces, we added Christian Aid success stories. It was an easy way to humanize the technology focus. Tip: It’s important that the courses you build connect the learner to the overall mission or objectives. It’s a reminder that they’re part of something bigger and a celebration of the organization’s accomplishments. 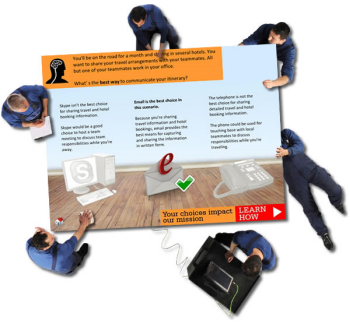 The course was built in a PowerPoint-based rapid elearning tool. This meant that long after we were gone, they could easily update & repurpose the course. To help them, we built a clean and easy-to-use template. All of the technology information pieces were built in Engage. 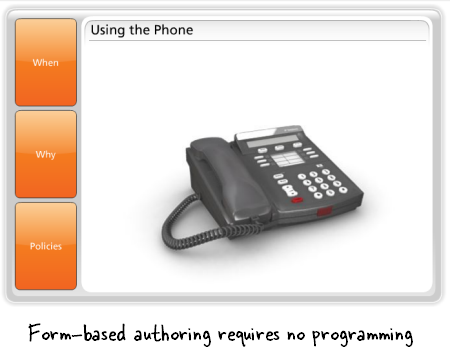 Engage is a form-based tool and requires no programming at all. That makes them easy to maintain and edit. In addition, all of the interactions could be pulled from the course and added to other web sites within the organization. The interactive track is a simple template structure that cycles through two core slides on the master layout, even though it looks more complex. That means if they wanted to add additional content, they could do so in minutes. Tip: Create templates and models that can be reused. It makes editing and maintaining the course easy. It also makes your client feel empowered. The more the client can do on their own later, the more time you save. Also, don’t spend time building custom Flash pieces if a form-based tool can do the job faster. Clean look and feel. One concern is that many elearning courses get crowded out with too much visual data. There are logos, buttons, boxes and instructions all over the place. We had two goals with the visual design: lots of whitespace and non-technology look. We wanted a course that was clean and aesthetically appealing. Definitely didn’t want anything that looked like a PowerPoint slide. So we went with a lot of open space and white background. We also didn’t want the course to look like a typical technology course. We actually had one design treatment where everything was outside in a field. It looked cool, but probably was a little too “out there” for this course. We opted for a simple floor and wall background with nice clean icons. It gives the screen depth, a consistent look, and seems richer than just a flat background. nded elements plastered all over the place. But the trick is to incorporate the brand ideas without having to look like you’re entering the course in a NASCAR race. 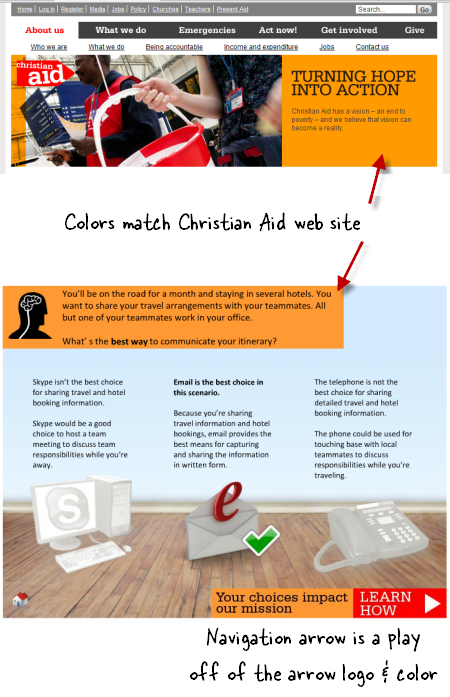 We chose a color scheme and design elements that integrated with Christian Aid’s brand. For example, the orange and red colors come from the branded web site. You’ll even notice that our direction arrow is tied to the Christian Aid logo. Tip: Branding doesn’t mean you have to have a logo on every screen. Instead, it’s more about associating the course with the organization’s visual identity. Find ways to incorporate colors, fonts, and design elements into the course interface. Navigation. The published course comes with the default player. 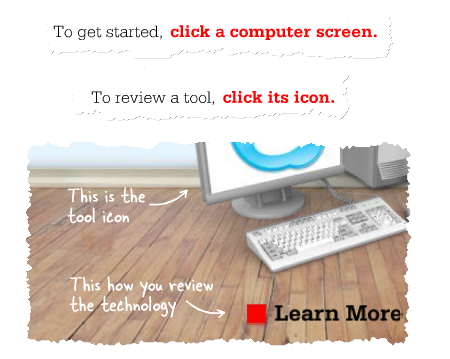 But there are times where we ask the learners to navigate by clicking on the screen instead. Since it was different than the default player, we used animation to accentuate the navigation option. We also clarified what the learner should do on the screen with explicit instructions. Tip: Make sure the navigation is clear and that you are consistent in how you use the screen elements. The Christian Aid course is a good example course for us because of the tight timeline and lack of budget. Are there things we could have done differently? Probably. But given the constraints, it demonstrates that you can still build effective and interactive elearning courses with limited resources and time. And we actually learned some new production techniques which I’ll share in an upcoming post. Great post – quick unrelated question. What’s that handwritten font you’ve used for this post? Hey thanks, this was an inspiring story. You have stretched my thinking about what’s possible. @Candy: in an upcoming post, I’ll share some tips on how to create a similar style template. 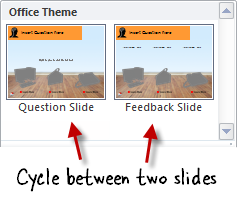 It’s really just cycling through two types of slides. I have a question about the engage that was embedded in the presentation. Did you just move the engage up on the slide or did you also resize it? If you did resize the engage, how do you prevent the issue where the visible area of the engage resizes, but leaves white space equal to the original size on the presentation. This post was so timely for me. I had been struggling with a way to adapt some of our courses for users that don’t have ability to hear sound when accessing the course. This is such an awesome idea! Just like so many others that I get from this blod. Thanks for sharing. Thank you very much, I like this note and found it very useful. I really like the way that this course is structured, and I like the combination of roll-over icons with Engage tabs in particular (instruction on how each communication mode is used). How was that achieved? I always learn something practical when reading your post Tom and you’ve influenced so many of my own e-learning courses. fyi. in case you hadn’t noticed..I think the slide- Web Ex Equipment- should read, “what” equipment do I need? While the entire course is amazing, I specially liked how the audio, video clippings were integrated. And the timing they appear. They made taking the assessment a pleasure. @Ben and Colin: I’m doing a follow up post where I show what we did with Engage. Basically we just inserted the .swf as a Flash file and moved it up. The post will discuss more of the details. @Mark: I use Elluminate on occasion. They have a free version. It’s always worked for me. Nice work on the Christian Aid presentation, Tom. I find your FREE E-Learning Tips invaluable and resourceful. Keep up the great work! I found your post interesting. Communication Technology with Christian Aides is something new in the field of Learning. I’ll review your project and take everything into consideration. I think it’s very useful. Nice post about these simple steps Tom! I’m first time here in your blog and will turn into regular readers. Keep up a good job! I think this is my favourite post of all time. The motivation for building the course was inspiring, and you’ve provided such great ideas for how to teach quite dry, instructional content and link it to a bigger picture. Just what I need! Thanks Tom. Ever wonder how an Articulate course looks on an iPad? I think these technics are very effective for learner’s interaction. I always learn something practical when reading your post Tom. The template for the interactive portion is free for navigation & very creative. But I have a problem.In our country we haven’t enough bandwidth. 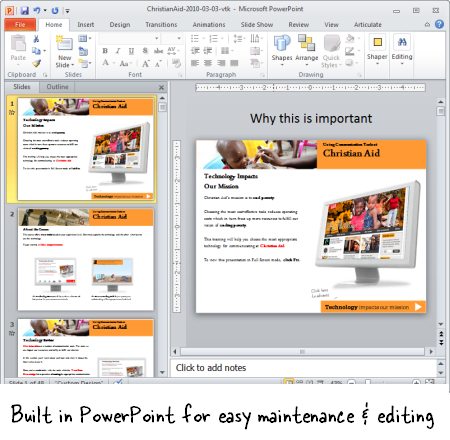 how I can reduce my powerpoint file size. Thanks as always for sharing.